Here's the web edition of the wedding bells story. Your flowers are featured in quite a few of the pictures. Jen and I want to thank you again so much! Our day wouldn’t have been complete without you. You made our vision come true & you truly have a talent beyond words. Thank you for all your hard word! It was such a pleasure meeting you. I told you before that you were our favorite vendor and I really meant it. You’re such a nice person & You’ve been so accommodating. We will keep your contact info & refer you to everyone we know! It was an honor for us! I just wanted to thank you so much for the beautiful flowers on our wedding! We received so many compliments and they were gorgeous! I was so happy with them. Once I receive the professional photos I will send along in case you want to use for future brides. Thank you again for making our day so beautiful! So sorry for my delay in sending this note, but I wanted to reach out to say thank you, thank you, thank you for the amazing work you did for our wedding! We received so many compliments on our flowers and when I first saw the reception space I was overwhelmed by how beautiful it looked with all of the centerpieces on the tables. You so perfectly captured exactly what I was envisioning. I will happily recommend you to anyone looking for beautiful flowers and I wish you all the best! Here is a picture my brother's girlfriend took of the centerpiece she took home the day after. It looks so pretty! Once we get our official pictures from our photographer when she sends them over, as I am sure she will have some wonderful pictures of the flowers. We really can't tell you enough how happy we were with the flowers, they were simply stunning! The photographer really captured how beautiful they were so I hope you enjoy the photos as much as we did. Working with you was such a great experience we certainly won't hesitate to pass your name along to others! You have a true gift, not just with your arranging, but also with understanding people and what they envision. You nailed it!! I had so much fun visiting with you and choosing flowers...one of my highlights of wedding preps!! I absolutely loved having Candice as our florist for our wedding a few weeks ago. Despite my vague descriptions and ever changing ideas, Candice was able to translate my emails into fresh and gorgeous bouquets, lapel pins, corsages and centrepiece wreaths! We were never able to meet in person (because of my schedule) which worried me at the beginning of the process, but she answered all emails quickly and descriptively, and delivered everything exactly on time. We didn't have a specified decor person, but Candice amazingly arranged the wreaths around our own lanterns perfectly as our backdrop and up the aisle. I can't say enough wonderful things about Candice, she was recommended to me by a friend and was honestly our one and only choice. We hope this email finds you well. We just wanted to send a quick note to THANK YOU for everything! Your flowers were beautiful and everything we envisioned and more! We received a ton of compliments on your flowers and the staff at Palais Royale also expressed how you were so easy to work with. Even for us, from the very start, you have always been so professional and working with you was an absolute pleasure. From the bottom of our hearts, thank you for helping make our wedding so special and translating our vision into reality. Once we receive our wedding photos from our photographer, we will be sure to share them with you. Just wanted to send a note to THANK you for all your help with our wedding on Saturday. It was easily the best day of our lives and everything went perfectly. We absolutely loved all the flowers - they were STUNNING! The ruscus on the tables was an AMAZING last minute decision! You were an absolute pleasure to work with and we will definitely be referring your name to friends in the future. We are about to board our flight to leave for honeymoon but I wanted to drop you a line to thank you so much for your hard work and the absolutely beautiful flowers. I almost cried when I saw the arch and the ceremony set up and you just nailed the bouquets, centerpieces and everything else - totally got our vision. We received so many compliments on the flowers. We will definitely send you some photos when we get them back. Dale and I just wanted to say how amazing the flowers looked for our wedding day. I knew as soon as we set our Wedding date that you were going to be the one I went to. You are so easy to work with and so good at what you do. You made everything look absolutely stunning. Dale didn't see anything until the day of and he was blown away. My bouquet was everything I dreamed it would be. The little touches here and there with the petals and adding on the flowers to the card box were beautiful. I am so happy that we met you long ago on Auger Terrace and am glad we can call you a friend. Thank you for making our special day so beautiful and amazing with your beautiful flowers. I just wanted to say thank you for the wonderful job that you did for my shower. The flowers were so beautiful and everyone loved them!!! You are such a sweetheart to work with and truly talented. I will for sure be recommending you to my Toronto friends. I will send you some pictures of the centrepieces once my brother sends me the photos he took. You can add it to your portfolio. Best of luck in your future weddings! I just wanted to say THANK YOU so so so much for the absolutely beautiful flowers last weekend! I think Kyle and I have finally recovered from Saturday and are still reflecting on how well the day went! We are so grateful for the hard work you put in and are SO looking forward to seeing the pictures, we will be sure to send a few along when we get them! Most of the roses are still holding out and making our house feel extra sweet this week! I can not thank you enough. It was even better than I ever imagined it could be ❤ thank you for all your work yesterday. The set up was ridiculously gorgeous. I just got back from our honeymoon in Hawaii and am finally able to sit down and send you a proper thank you e-mail. Thank you SO SO much for all the beautiful wedding flowers!! I cannot begin to describe how perfect they were and how much of a special touch they added to our day!! I was in love with my bouquet and all the bouquets for my girls!! The guys boutonnieres were spot on as were the corsages. We saw the hall the day before set-up with everything except your centerpieces and when we walk in that day my jaw-dropped. Honestly they made the decor!! They were absolutely perfect - everything about them and I loved the big arrangement in the middle of us. The cake topper was amazing too and added to Carolyn's cake wonderfully! You are so talented, creative, detailed and amazing to work with!! I cannot thank you enough for everything. I just wanted to email you quickly to say thank you. HONESTLY, you outdid yourself. The flowers were absolutely stunning. My bouquet...unreal! When I was passed my bouquet and saw how beautiful it was I started to cry, then I saw how beautifully you pinned my chains and cried even more lol! Again, thank you so much for everything! I loved everything down to the last placement of each leaf! I apologize for the late email but we just returned from Jamaica! Thank you so much for my amazing wedding flowers!!! The flowers were EXACTLY what I had pictured in my mind and you nailed it!!! It was an amazing day and I am forever grateful!! Thank you for being so caring and compassionate and understanding throughout the entire process! You are amazing at what you do !!!! Thank you, thank you, thank you - a million times over!!! Thank you so much for the work you put into the flowers. They turned out exactly as I had hoped for and were complimented on right and left. You definitely played a huge role in making our day and I will send you some photos once we get them. Thank you!! Just wanted to thank you again for the awesome job with the flowers! They were so gorgeous! Blake was thrilled with all the bouquets and the centre pieces were exceptional. Everything held up for the day and the bouquets still look fresh today. Everyone commented on the centre pieces and wanted one! We couldn't be happier. You truly made the day even more special. I will be happy to refer you to everyone I know! Thanks again! Julian and I just wanted to take a moment to say thank you so much for all of the flowers and decor that you provided--- as well as your advice! You are amazing and made our day really special. Thank you for everything! I have attached some photos. Of course our flower girls did not want to throw their rose petals away so they still have them in their bedrooms at home...lol! All the best to you and thank you again! I wanted to send you a quick email to say thank you so much for everything! When I started planning my wedding figuring out the flowers stressed me out but as soon as we met I felt so much relief! You are such an awesome person and passionate about what you do and it was so nice to work with you. You really helped me figure it all out and everything looked absolutely beautiful! The bouquets, the centerpieces, everything was gorgeous and I had so many compliments as well! Thank you again!!! I just wanted to thank you SO much for all the wonderful flowers for my bridal shower. They were perfect and created the best ambiance and touch to all the decor. We loved the bouquets as well. Thanks for coming and for all the set up you did putting them on all the tables and organizing the head table. The day was fabulous. I'll send you some of the professional photos from my photographer once I get them. Looking forward to working with you again!! Thank you for everything! All of flowers were absolutely beautiful!!!!! You are so good at what you do!! A huge thank you for making our day so BEAUTIFUL! You took all the stress away every time we met with you. Cannot thank you enough, you were a pleasure to work with and did a FANTASTIC job! The flowers were stunning- more beautiful than I imagined! So many of our guests commented on how beautiful the bouquets and centerpieces were. Sorry it has taken so long for us to write to thank you! We really appreciate how professional and easy you were to work with. Thank you for taking my inspiration and making it a reality! We will recommend you to all our friends! I always knew that I loved your work, but I love it even more after seeing the gorgeous arrangements and bouquets that you created for our wedding day (you could probably tell by the million hugs I gave you)!! It was STUNNING! PERFECT! Exactly what I had imagined and hoped for! So many of our guests commented that it was the most beautiful wedding they had ever been to and the flowers played such a huge part in that. All of the girls were so shocked by their bouquets and totally loved them. Nobody could have possibly loved their bouquet as much as me though! I keep looking back at pictures and thinking how absolutely perfect it was! You even found those pink orchids!! It is this kind of attention to detail that makes your work so stunning and makes you an absolute pleasure to work with. That and your patience with totally picky and indecisive brides like me! You have a gift!! I will definitely recommend you to future brides and anyone hosting an event! I just wanted to send you a note saying THANK YOU! I absolutely loved the flower arrangements. I was in awe when I saw them, I couldn't have asked for anything better. Thanks so much for helping to make our wedding day so wonderful. Just wanted to drop you a line to say thank you SO MUCH for our beautiful flowers for the wedding. They were stunning, and everyone commented on them. People were fighting to take home the centrepieces at the end of the night lol :) You were great to work with, and I'm recommending you to everyone I know. The flowers were incredibly lovely and really brought my dream of having an 'outdoor' wedding indoors to life. My bouquet was stunning and perfectly encapsulated my vision, plus the lavender smelled amazing! Thank you so much for all of your hard work! I just wanted to thank you SO MUCH for everything last weekend. 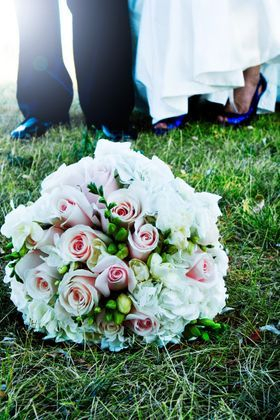 The flowers were BEAUTIFUL and we had so many compliments on the bouquets. And all the centrepieces were SO beautiful. I loved them. They were perfect. It was so great not having to worry about any of that and just trusting and knowing you'd make everything perfect. And you did!! Thank you again so much! I was sorry to have missed you on Saturday during my flower delivery. As you can imagine, things were a bit crazy for me:) I didn't get a chance to look at the flowers until the very last minute before we were leaving but when I did, I couldn't help but gasp. They were GORGEOUS!!!! And though I knew you would do a bang-up job with them, they were even above and beyond what I was expecting. It all came together so perfectly- they matched our dresses wonderfully and went with the theme so well. And the berries were the PERFECT colour!!!! You must've threatened/coerced/bribed the floral suppliers to get them that beautiful!!!! 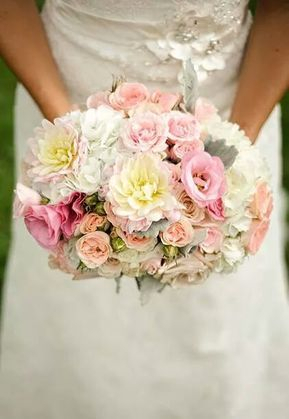 If only I could have a big floral "PAUSE" button to make my bouquet stay with me forever:). Thank-you so much again for your wonderful work. You are truly a gem! We just got back from our honeymoon and it was fantastic. I just wanted to send you a note saying THANK YOU! I absolutely loved the flower arrangements. I was in awe when I saw them, I couldn't have asked for anything better. Thanks so much for helping to make our wedding day so wonderful. First I wanted to thank you for all the flower arrangements/boutonnieres/etc. Everything was perfect and I'm not just exaggerating! I absolutely loved my bouquet and got so many compliments on all your work. Thank you thank you thank you! The bouquets for my wedding and shower turned out exactly how I wanted and imagined them to be, and they all looked amazing. 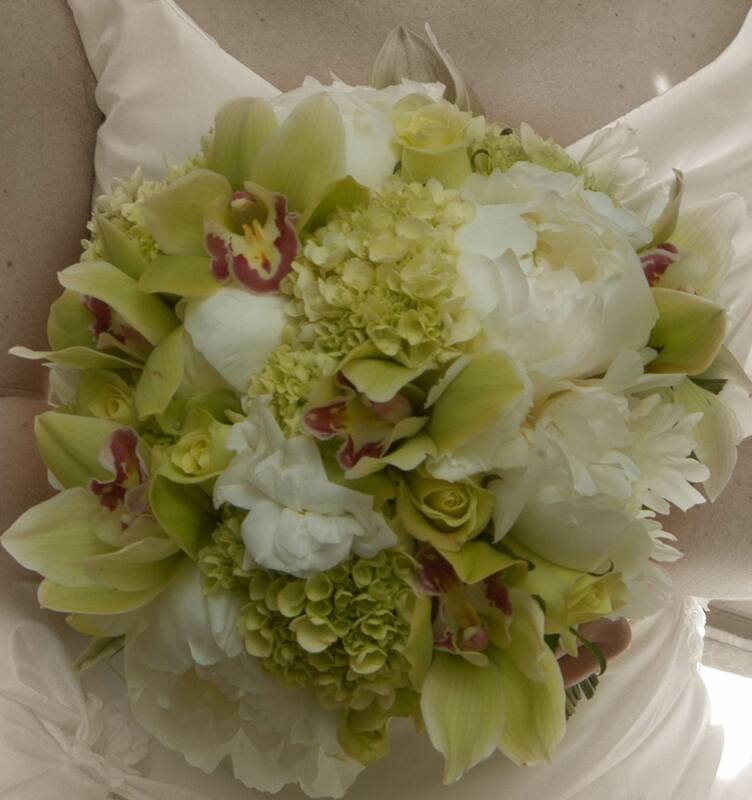 Her rates are extremely reasonable, she had great advice and the flowers were exactly what we wanted - simply beautiful. I went into our first meeting not knowing exactly what I wanted. She was patient and helpful as we looked through portfolios of bouquets. She told me what would be in season to help me stay within my budget. We later had to change the flower colour because the colour of the bridesmaid dresses changed and she was very accommodating. She delivered my flowers and the bridesmaids to where I was getting ready then took the boys boutonnieres to where they were getting ready and she was on time which is so important on any wedding day. The flowers lasted all day and night and are still going strong 1 week after the wedding. It was a pleasure working with her and I will for sure be going back for her services in the future! Just wanted to say that you absolutely ROCKED the decor yesterday!! first of all, the bouquets you made were beyond stunning. EVERYone commented on how cool and unique they were, you did such a great job!! and I loved the craspedia, you truly did everything exactly how I hoped you would! you are a pro!! I thought the head table looked gorgeous too!! and on top of that, you're like, the sweetest gal in the world! so nice, and so helpful. Thank you so much for everything, especially doing the extra setting up of centrepieces... I feel bad you had to problem solve and deal with stuff... you really went above and beyond! I will without hesitation recco you to every single person who is looking for a floral genius! take care! I just wanted to thank you for the beautiful job you did with the flowers. They were absolutely perfect and we had many people comment on how pretty they were and how the colours were perfect for the day. We had a blast at the wedding & everything was perfect. Thanks again! I will definitely tell everyone what a great job you did! We are back from our honeymoon and have completed our move to Washington and I just wanted to let you know that I absolutely LOVED the flowers you did for us. They were my favourite part of the day (other than the getting married part of course!) I was sad to leave for our honeymoon because I couldn't take any of them with us to enjoy! Cory and I would like to thank you for providing us with such beautiful flowers for our June 21st wedding! The bouquets were so beautiful and looked great with the dresses. The centre pieces looked great and really brightened the room. I am still getting complements on how pretty the flowers arrangements were. Thank you! Working with you was truly a pleasure. You were so organized and thorough and I felt completely confident that all our details would be taken care of ~ and they were. I will send you a picture of us with the flowers (once we get our pictures). I just wanted you to know how happy we were with your service. I will definitely recommend your services to my friends and family. Thank you! Tom and I would like to thank you for the AMAZING job you did with the flowers. I loved my bouquet and the centerpieces were beautiful. We also loved the big vase full of tropical greenery and flowers. Everything looked fantastic and we'd do the flowers the exact same if we were to do it again. Thank you so much! I wanted to wait to send you a card, which I still will do, but I couldn't wait to tell you how great of a job you did for my wedding. It was soooo Beautiful!! When I first walked in the hall I was amazed at how everything came together so nicely. The bouquets were perfect in every way! Thanks so much for making my day so beautiful! Our flowers were absolutely beautiful!!!! I can't thank you enough for the wonderful job you did! They were perfect and added the final touch to my whole bridal look, making me feel so elegant and beautiful holding my bouquet. My bouquet was so beautiful, it was even better than I thought it could possibly be! Perfect doesn't even begin to describe it!! We had a great day, weather was perfect, enjoyed every minute, too bad it went by so fast! Thank you again for doing such a wonderful job on our flowers!!!!!! I just wanted to say thank you so much for the beautiful flowers! I honestly couldn't have asked for more and you were amazing to work with. I loved every thing that you did and couldn't have been any happier with it all. Thank you so much and I can't wait to recommend you to friends and family! Best of luck, hope to work with you again! !